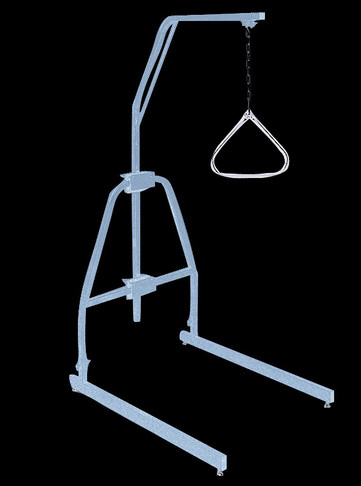 This is the type of trapeze bar we have over the bed. It provides assistance and leverage for my husband to shimmy into a comfortable position quite effectively. We are in a bit of a limbo with my husband’s care. Since his picc line was removed we don’t need the visiting nurse at present. Also due to the fact that we are doing our own investigations with respect to diet – particularly the alkaline diet, we are not using the services of the nutritionist provided by CCAC. Sooooo what this means is that CCAC has closed our file. The only issue with them closing our file is that we have loaner equipment in place in the house which we are no longer covered for since they have closed our file. Yes they know he is still Stage 4, and that there may be future treatments and needs, but if no active services are being provided then the file closes. Ironically I consider the provision of the loaner equipment as an active supportive service, but this is not how CCAC sees it.. Consequently the equipment goes and I have arranged for Shopper’s Home Health Care to come tomorrow and retrieve the remaining pieces of loaner equipment. Problem is, I think that the removal of one of the pieces in particular is causing my husband some consternation. His back, specifically his T6, 11 and 12 are pooched and so it makes it hard for him to shift his position once he is lying down. Although we have our own electric bed for his comfort we requested a trapeze bar for over the bed. This piece of equipment is quite wonderful. My husband can shift an inch or two up or down or sideways without the significant effort that is involved without this support. He tends to rely heavily on the bar to get into a sitting position to get out of bed, and even uses it to ease himself into a reclining position. Although he is game to try and do without it, I think tomorrow when they come for the gear I will keep this one and continue to rent it on our own – if they rent them privately. Just seems like such an unnecessary source of stress or discomfort to put him under if a few bucks a month will make it go away. We earn money to spend it, not horde for some other time. I think we may actually be in that “rainy day” scenario referred to in the saying “save it for a rainy day.” I’d say I will see what he has to say when he gets up in the morning, but really I’m not likely to, I think I will just make the decision to keep it for a little bit longer.